Behold, "The Space Robot Equivalent Of An Owl Pellet"
NASA's Curiosity rover recently... erm... "unburdened" itself of a rock sample, then took a photo to mark the occasion. 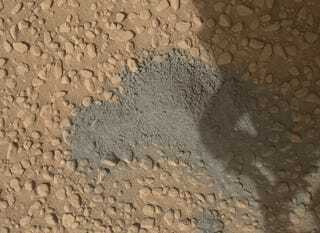 The small pile of Martian material was collected back in May at the Windjana drill site, the fourth location from which Curiosity has probed the planet's terrain. We like to think Curiosity regards its pile of Martian dust-barf the way a cat might regard a hairball, and that this photograph is the rover's way of confirming that it, similar to a cat with its bile-matted fur-nugget, has left this pile here intentionally, in plain site, for you to look at and/or step on. More on the Windjana drill site here.